Board portals are tools that provide secure digital communication between members of a board of directors for efficient communication and good governance. BoardBookit includes the board portal features that matter including discussions, voting, document management, meeting minutes, agenda features and other tools to help make communication as seamless as possible. All features are available anytime, anywhere on any device without add-on fees and apps. Save time and money with the features you need at a price you can afford. 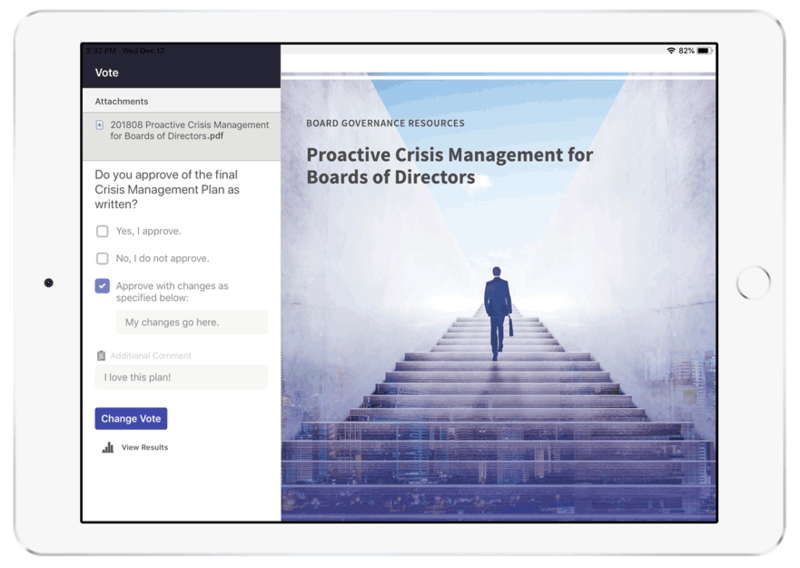 Built for your board with input from directors and corporate secretaries to enhance board governance and promote collaboration, BoardBookit board portal features are always available in a secure board management platform. Board directors can control and manage their board business easily on a paperless cloud-based platform 24 x 7 x 365. Key features include easy agenda building, integrated board meeting minutes, and enhanced voting capabilities. Board portal features are immediately available at login without complicated actions by Board Directors or investment in IT Resources. 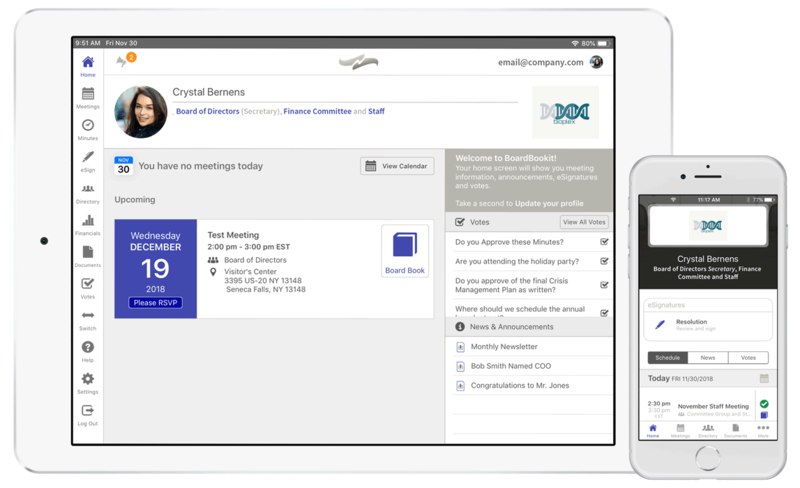 Schedule meetings, track attendance, manage board rosters, agendas, documents, and annotations, plus so much more – online in real-time or offline. ARE YOU READY TO ENHANCE YOUR BOARD MANAGEMENT? GET A PERSONALIZED DEMO TODAY! 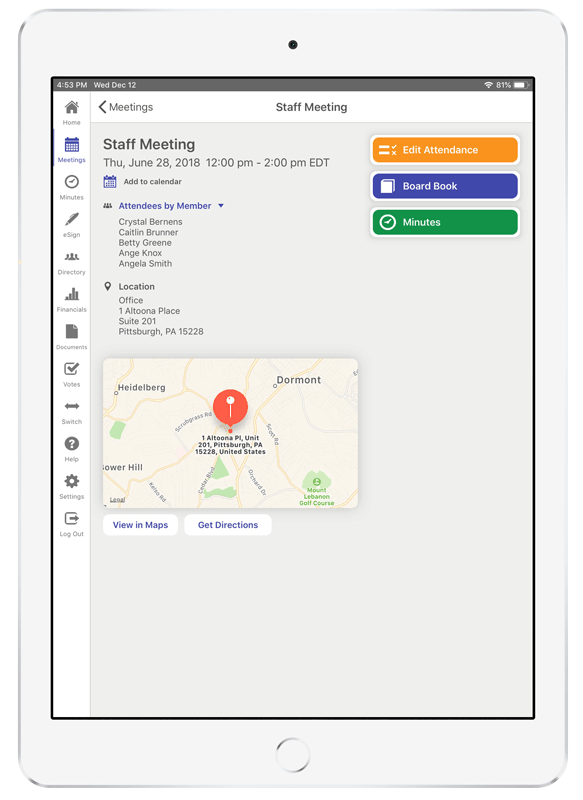 BoardBookit features a powerful meeting management system with meeting minutes features that captures annotations, assigns action items, formats the minutes into a professional looking document and distributes agendas and meeting minutes with a few clicks. 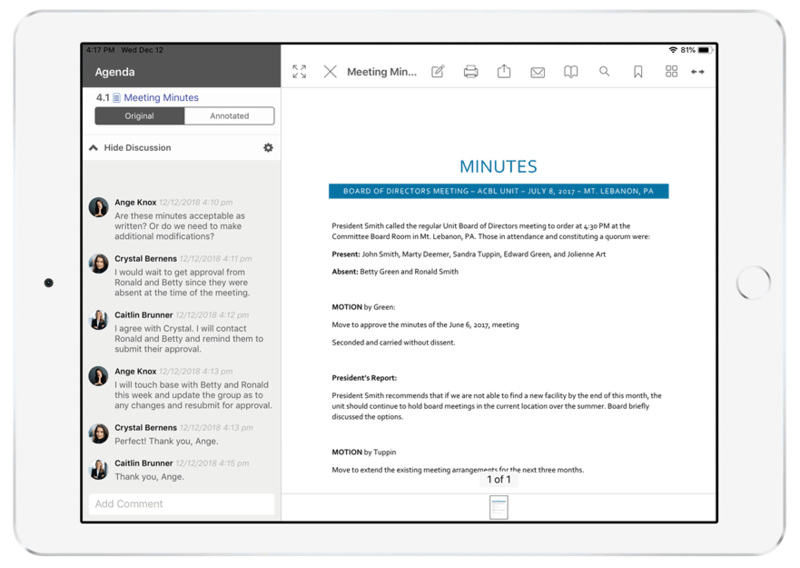 Create organized meeting minutes with a WYSIWIG text editor. 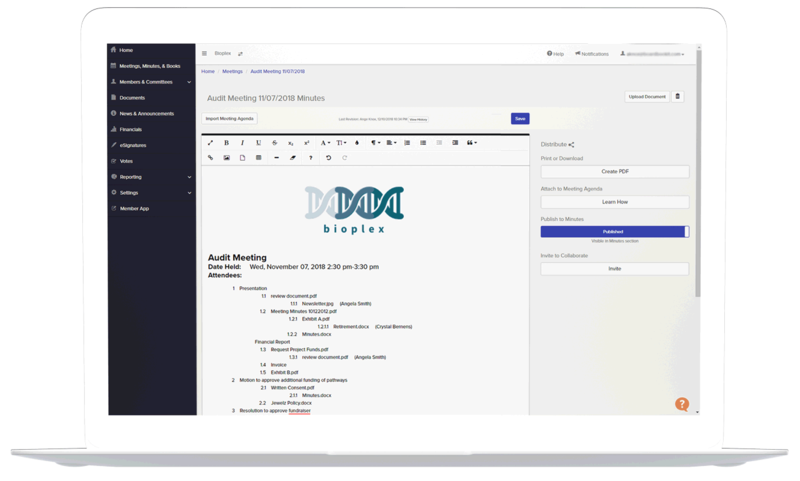 Build meeting minutes with options like bulleted items, numbered lists, images, hyperlinks, and more. Enhanced collaboration tools allow input from multiple people to edit minutes while BoardBookit keeps a detailed version history. Start with a template you have already created online or offline, import the meeting agenda, or create a document from scratch. Send meeting minutes electronically and use BoardBookit Voting and eSign for director approval. BoardBookit will archive approved minutes and securely purge drafts and notes after approval. Clarify agenda items and comment on supporting documents with live discussions directly in the intuitive and secure BoardBookit platform. BoardBookit Discussions is trusted by companies worldwide for secure collaboration. Stay up-to-date on board business, ask questions, and add comments while viewing annotated documents from every device in real-time. Eliminate the risks of email by holding private conversations in Discussions’ secure messaging channel. Users have the ability to retract their own comments and admins can delete or purge any communication. BoardBookit backs up your data and keeps it secure with redundant managed firewalls, SSAE-18 certification, and backup sites in disaster-neutral areas. Users have peace of mind knowing their communication is safe with Two-Factor authentication and remote wiping capabilities. Create flexible voting options for effective decision making from any device, directly in the BoardBookit platform. Set voting security permissions, attach supporting documents, and view detailed reports during and in between scheduled board meetings. Publish voting ballots for open and active voting or close ballots to all voters. Set permissions for secure voting in and out of the boardroom. Access archived ballots and results easily by searching for the ballot name. Adaptable voting ballot options for every decision including checkboxes, radio buttons, text boxes, and paragraph responses. Attach supporting documents for informed decision making. Allow voting members to see results specifically by member, by count and/or percentage, or restrict members from viewing any results.